The pie charts below show the frequency of disc displacement in 134 pre-orthodontic children around the age of 12 years as reported by Nebbe and Major. Surprisingly, about 60% of the boys and 85% of the girls had unilateral or bilateral disc displacement. The right disc was experimentally displaced in animals. As a result, the growth of the right side of the mandible was suppressed, causing the midline to shift to the right. This is analogous to the application of a break only to the right side of an automobile. 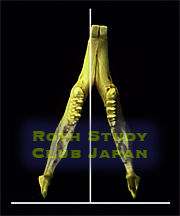 The right side of the mandible showed decreases in both length and height. Disc displacement has major adverse effects on mandibular growth, causing facial asymmetry and distortion. It also has a big impact on the occlusion. In a more recent animal experiment in Sweden, functional appliances (appliances that position the mandible forward), which had been extensively used in the US at one time, were placed in rabbits with disc displacement. Mandibular growth was suppressed in the group of rabbits wearing a functional appliance as compared with a control group without the appliance wear. Not only is disc displacement important for maintenance of jaw function and bone preservation in both children and adults, but it has a profound influence on mandibular growth in children. Let's look at the structure and function of the TMJ more closely on CT and MRI images of an actual patient. The disc, indicated in yellow, is interposed tightly between the fossa and the condyle in a normal joint and moves with the condyle in mandibular movement. The disc is a soft tissue and therefore not visible on CT images. It can be seen as a dark object on MRI images. The posterior band (thicker posterior part) of the disc is at the 12 o'clock position. 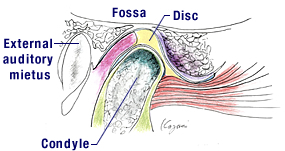 The position and status of the disc, though not shown on CT images, can be estimated from the bone status and relationship of the condyle and the fossa. CT images thus give us a clue to the position and health status of the disc and the joint as a whole. These images show the joint of a 12-year-old patient who is nearly asymptomatic. The disc is beginning to be displaced. The position of the condyle in the fossa is displaced a little posteriorly. When this occurs on the right side, the mandible gets deviated to the right, causing the posterior teeth on the right side to hit harder and start to wear. This case has more advanced anterior disc displacement with clicking sounds in opening and closing. The patient is aware of the symptom at this stage. Temporary locking of the joint and difficulty of mouth opening may occur with the disc in this position. This may be associated with pain. The joint in this condition is more likely to progress to the next stage. The disc is completely displaced forward and downward. The jaw is locked, preventing wide opening of the mouth. This is often associated with pain on opening, although a few patients who progressed to this stage remain asymptomatic. Bony structures of the joint may undergo significant changes, resulting in gross displacement of the jaw. Complete disc displacement can occur in children as well.